Headaches are your body’s response to physical or emotional stress. That stress can make the muscles in your head and neck contract to create tension headaches. Or it can make blood vessels constrict and later expand to produce migraines or vascular headaches. And if your sinuses are congested or infected, pounding headaches often result. Despite the discomfort, most headaches are temporary and respond quite nicely to do-it-yourself treatments. Acupressure works by stimulating the pressure points by massaging them will help relax the tight muscles and increase blood circulation, thus relieving the headaches. 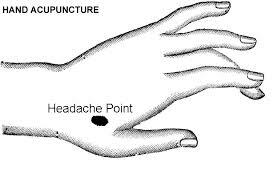 Pressure points are clusters of nerves located at various points on the body, which help regulate blood circulation. Locate your temples. They are on either side of your head about 1 inch (2.54 centimeters) behind your eyes. Place your thumbs on your temples and simultaneously massage them by gently rotating your thumbs in a counter-clockwise direction. Place your thumbs at the back of your neck, on the base of your skull on the two sides of your spinal column. Tilt your head back a bit and press your thumbs in while pushing slightly upward. Find the meaty part on the back of your hand. It is just above the webbing between the thumb and the index finger. Using your other thumb, squeeze the muscle by pressing down hard. Place your index finger between your big toe and your second toe. Move your finger up about 1 inch (2.54 centimeters) to where the bones of your toes meet the inside of your foot. Press that point straight down.